Single Serving One Pager that generates an optimistic “yes”, “yes” or “no”. Simple but lovely addition with the fun custom cursors – especially when the hand transforms to crossed fingers when hovering over the close X icon in the off-canvas area. If you’re wondering why Y-Y-N, the algorithm is tweaked to favor “Yes” twice for every 3 requests – hence the tagline “for a more optimistic 2017” – great little bit of branding work. 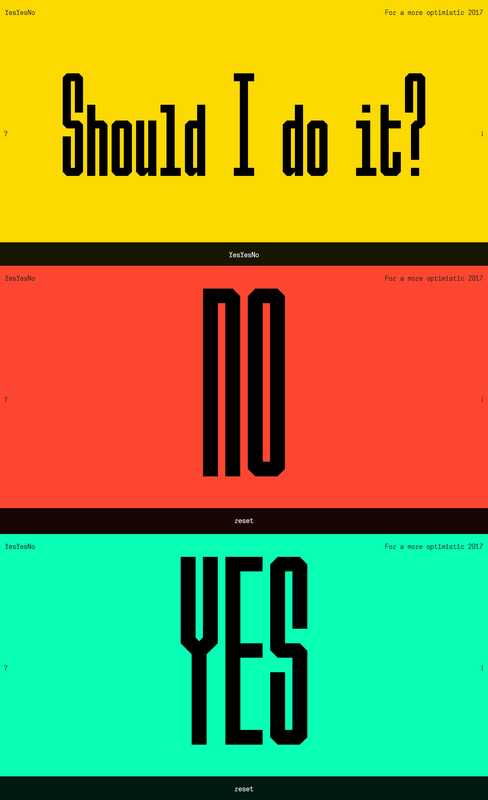 YesYesNo – A web based New Years resolution – For a more optimistic 2017. Responsive Fonts – based on VH and VW instead of REM or PX. Custom cursors – every hover element have its own special cursor.